ETOBICOKE, Ont. 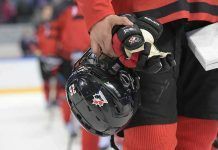 – Hockey Canada has announced the addition of 11 players to its pre-tournament roster for the 2017 IIHF U18 World Championship in Poprad and Spisska Nova Ves, Slovakia, beginning later this month. Joining the early roster announced on April 4 are goaltenders Alexis Gravel (Asbestos, Que./Halifax, QMJHL) and Jacob McGrath (Mississauga, Ont./Sudbury, OHL); defencemen Josh Brook (Roblin, Man./Moose Jaw, WHL), Jocktan Chainey (Asbestos, Que./Halifax, QMJHL), Jared McIsaac (Truro, N.S./Halifax, QMJHL) and Jett Woo (Winnipeg/Moose Jaw, WHL); and forwards MacKenzie Entwistle (Georgetown, Ont./Hamilton, OHL), Liam Hawel (Arnprior, Ont./Guelph, OHL), Kyle Olson (Calgary/Tri-City, WHL), Nate Schnarr (Waterloo, Ont./Guelph, OHL), and Matthew Strome (Mississauga, Ont./Hamilton, OHL). Gravel, Woo, and McIsaac join the six previously-announced under-aged players who are using the pre-tournament camp and games as an opportunity to further develop and gain international experience. Hockey Canada will still have an opportunity to add players to the roster as teams are eliminated in Canadian Hockey League (CHL) playoffs. The team departs today for Slovakia to continue its training camp and play two pre-tournament games – April 9 in Bratislava versus Russia; and April 10 in Piestany versus Switzerland. Canada opens the 2017 IIHF U18 World Championship on April 13 against Latvia; it will also play Finland, Slovakia and Switzerland in preliminary-round action. Canada has won seven medals at the IIHF U18 World Championship, including three gold medals (2003, 2008, 2013).